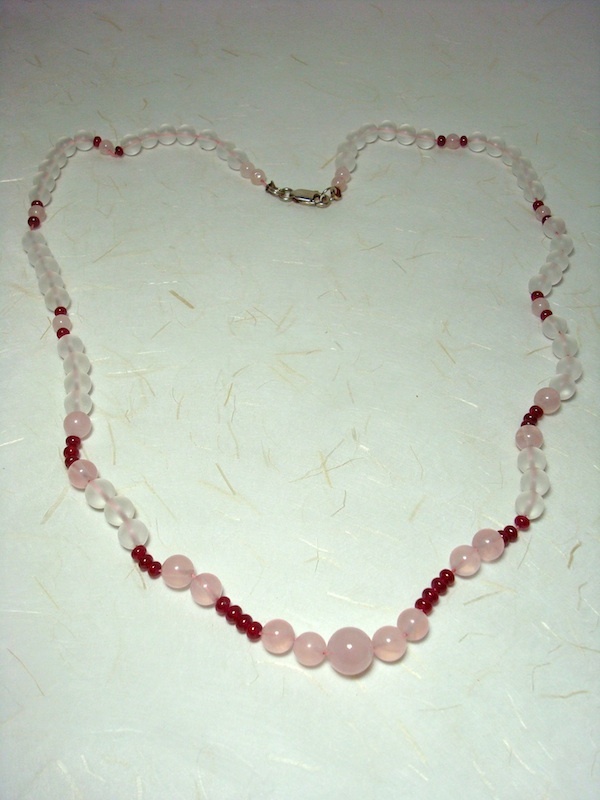 Using the energetic qualities of Ruby, Rose Quartz and the amplifying power of Rock Crystal Quartz, this necklace helps those who hold subconscious wounds that hold them back from receiving all the Love they desire from a mate. 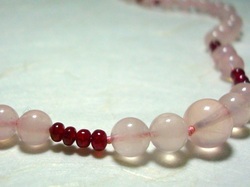 Rose Quartz soothes and massages your emotional body. Held back notions of the fear of love, or other limitations to love can then be gently released. Your heart becomes more open, softer towards others and they will feel you are more inviting to be around. 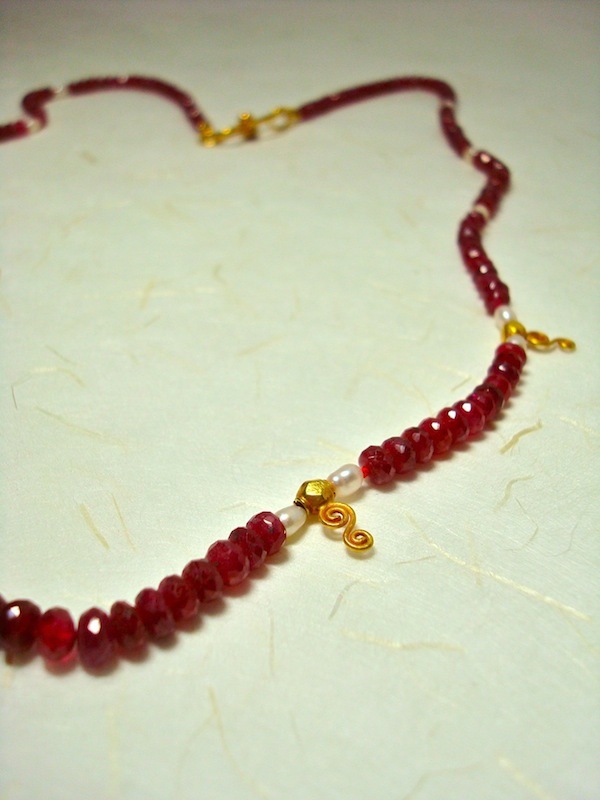 Ruby carries the Red Ray, which deliver to the wearer a steady stream of Divine Love equally distributed throughout the entire aura. With Divine Love, your need for human love is placed in balance, as your awareness of All the Love There Is permeates your entire being. Rock Crystal Quartz spheres amplify the power of the stones that surround it, and in this case amplify your ability to give and receive more love. Its work is furthered by balancing and bringing in new Life Force so you are enlivened, attractive and sharing of your warmth and divinity. By healing our emotional resistance (Rose Quartz) and becoming filled with Divine Love (Ruby), we become highly magnetic to attracting love all around us. This is one of my all-time favorites. 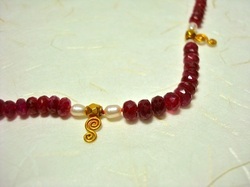 Available with a silver or gold clasp and threaded on 100% silk. And don't be surprised if your lonely days will be over either. You'll be wrapped in Love, Divinely magnetic and feeling your heart soothed all over. I send you my blessings for this healing! 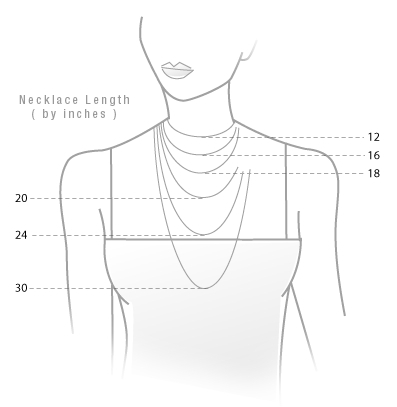 Do you know your necklace length? Many of our necklaces here at Spirit Source Connect can be made to order. Getting the right necklace length for you is our priority here, and we suggest you use this guide below to get an idea of what you want. Ordering the correct length can be easy. 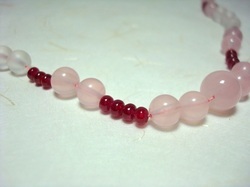 Simply get a piece of string, place it around your neck at the length you want, then measure how many inches it is. This way you can tell us which custom size you'd prefer. 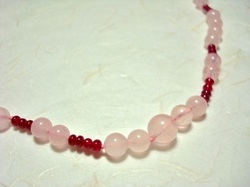 Standard sized necklaces are priced as listed. 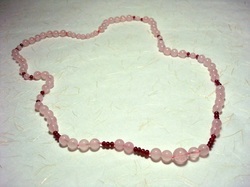 Custom sized necklaces go by weight and length so we will quote you separately on the necklace size of your choice. Perfect for a 'date night'. This faceted Ruby necklace is fashioned with 22K gold findings that are hand-made from India and graced on either side with the tiniest seed pearls. The prettiness of the pearls is a wonderful compliment to the Rubies and gold - sure to enhance your attractiveness and magnetism. 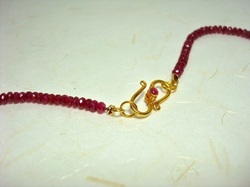 Ruby carries the Red Ray which transports Divine love through your heart and assists you with spreading it out to others. The results will be that you will feel loved and feel generosity of spirit to those around you. 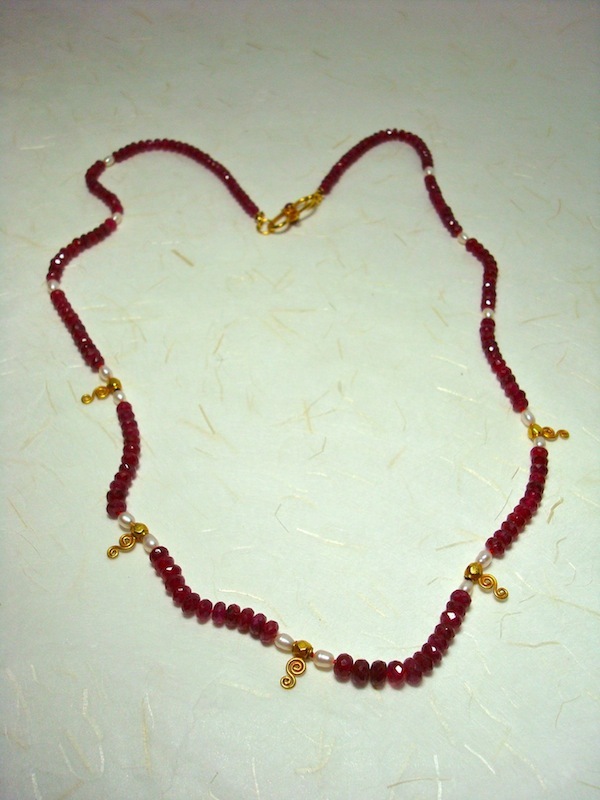 Whether you are seeking to extract a soul-love or just reignite the one you have, this necklace lifts you into that magnetic field of Divine Love. Available in smooth or faceted rounds. The facets on this Ruby necklace reflect back a sparkle that make it very nice for evening. Want Clarity on What's Right for You? 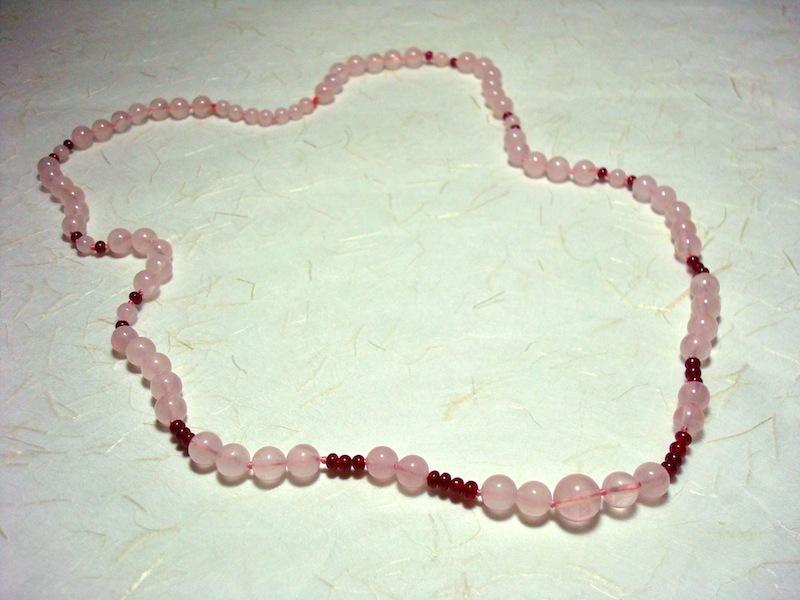 Pink Tourmaline - "The Enlightened Feminine"
When Pink Tourmaline is worn by a woman around her neck, it expands its energy outward to read her aura and then provides a casing of protection around her. Once she is protected, it will then give her the power, understanding and awareness to realize her full potential. If you are often feeling vulnerable around strong masculine energy or feeling overwhelmed by too many demands being made of you, Pink Tourmaline is an excellent option. It has the capacity to solidify your strength, increase your self-confidence and balancing the energy between you and the masculine energy in your life. 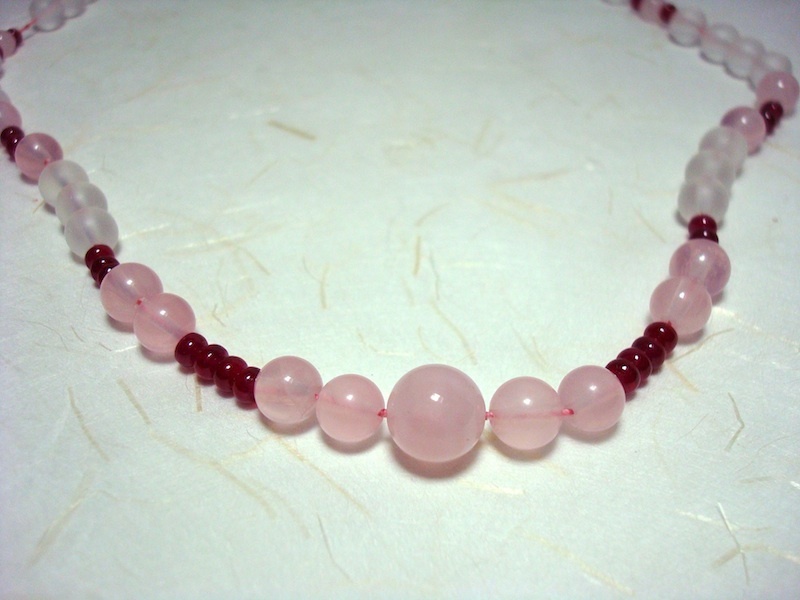 This beautiful gemstone is a carrier of the Pink Ray - the Ray of Light that gives life and vibrancy to the emotional plane of the planet. 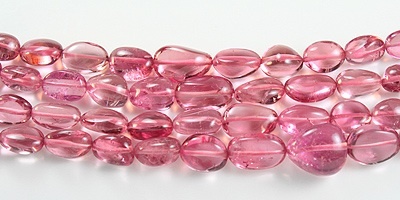 When this gemstone fills and reads your aura, you receive emotional support from the Pink Ray, giving you the opportunity to heal and evolve your emotional body. A variety designs and lengths are available on the Relationships page to suit your desired length, carat weight and type of metal clasp. 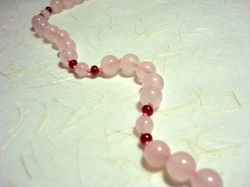 These Pink Tourmaline beads are very high clarity, polished smooth, flat oval rounds. This necklace is available in a single or multiple strands and a variety of lengths. 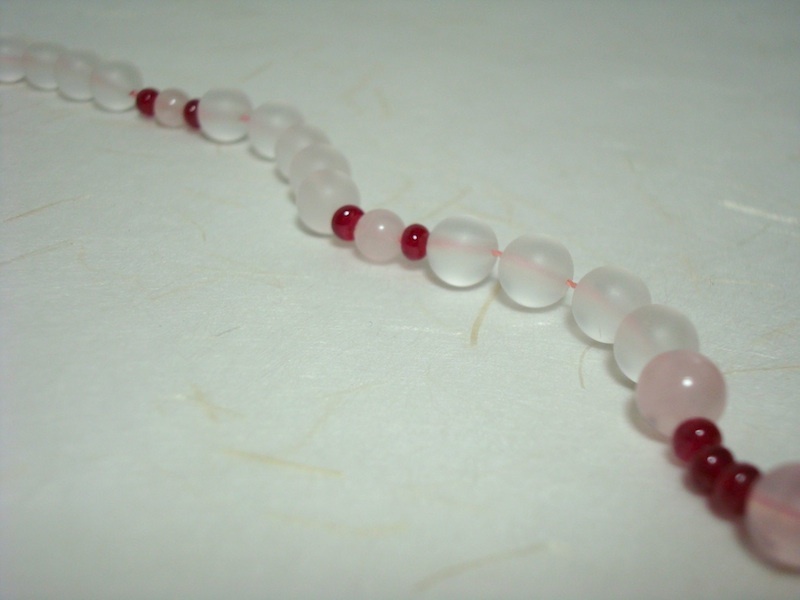 The power inherent in a single strand of these oval rounds is sufficient for "The Enlightened Feminine." Please contact customer support with your request, and we'll return to you a quote. Green Tourmaline - "The Enlightened Masculine"
Green Tourmaline necklace options are for balancing masculine energies, and should only be worn by men. When couples wear these respective necklaces according to their own energies, the balance of power between the masculine and the feminine is harmonized. Bickering, power plays and confusions in communication stop. The attraction towards the other builds, and happiness and playfulness is restored to your relationship. Confused? Want Clarity on What's Right for You? Schedule an Energetic Gemstone Consult.